If you like Interactive Calendar software and are interested in updates, we can send you notifications about new versions. Select Help - Information about updates main menu item to subscribe to or unsubscribe from the our special newsletter. We guarantee that your email address will not be shared with third parties or used inappropriately. Also you can run the built-in Updates Checker by clicking the "Help - Check for updates" main menu item. 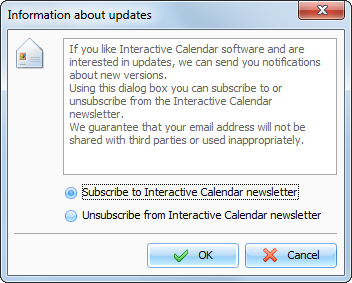 Interactive Calendar can check for updates automatically, if this option is turned on in the program's Options.